5 out of 11 pictures lost. Thanks to Colleen Crosby for caption help on this page. Colleen and I had talked, once upon a time, about throwing a party together. We felt that our skills would complement each other. We decided that Con-Dor would be the perfect place, because we wouldn't have any staff or concom obligations. And so we created this joint Baden-Crosby endeavor. We tried to think of a theme, and decided to go with basing the party on the book "Peace War" by the guest of honor, Vernor Vinge, and its sequel, "Marooned in Realtime." We managed to scare up some macaroons left over from Passover, and we called the party "Macarooned in Realtime." The ostensible sponsor was Vandenberg Bananas. I asked Shawn if he would come up with a banana crate label for "Vandenberg Bananas" in the style of the old orange crate labels. He came up with a beautiful logo showing an enormous bobble, the plantations, and a hot air balloon drifting by. (Which worked out perfectly for the occasion, because there were several balloons in the sky over Del Mar the weekend of the convention.) We used the logo on our party flyers, and Pat found three actual crates to put the logo on. Vernor Vinge signed one of the flyers for me, signed one of the crates for Shawn, and took one of the crates home to put books in. 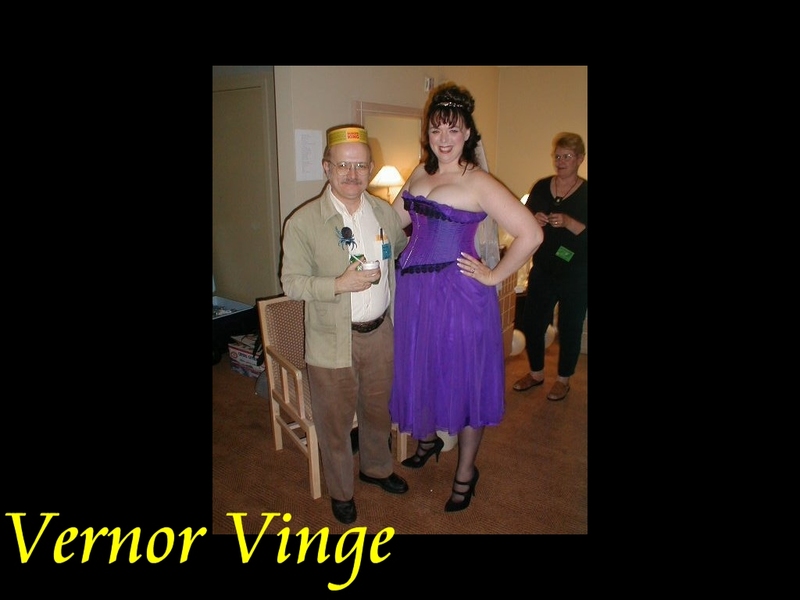 Mr. Vinge said that it was the best party of the convention, in his opinion. A roller cooler full of soda, in front of the door to the bathroom. (We should have put this in the center of the room - people tended to come into the room first, before looking for soda.) We had the following: A&W Cream Soda, Diet A&W Cream Soda, A&W Root Beer, Coca-Cola, Diet Coca-Cola, Countrytime Lemonade Flavor Drink, Dr Pepper, Diet Dr Pepper, Hansens Cherry Vanilla, Hansens Kiwi Strawberry, Hansens Mandarin Lime, Hansens Raspberry Soda, Hawaiian Punch, Mountain Dew, Nestea sweetened with lemon, Pepsi, Caffeine-Free Pepsi, Diet Caffeine-Free Pepsi, Ruby Red Squirt, Seven Up, Sprite, Vernors, Diet Vernors, Water. The "Primordial Soup" and the round rolls are on the dresser next to the television. (We should have put it with the Macarooni and Cheese.) The Primordial Soup contained a bag of Trader Joe's "17 Bean and Barley" soup mix, a packet of onion soup mix, some garlic and a bit of red pepper, a can of diced tomatos, and a lot of water. There are balloons in the corner, and on the nightstand is an overturned "Vandenberg Bananas" crate holding up a platter of hulled California strawberries and a bowl of melon balls. Colleen Crosby in the party room. Note flamingo on the headboard. There's a tub of Ralphs coconut macaroons and a big jar of "Bobble Gum" on the nightstand. The hotel managed to mix up the convention's junior suites - they double-booked them and it took a while to straighten out. At one point the convention had allocated me a room on the third floor - which would have been on the same floor as my sleeping room, but we would have been the only party on that floor. We wouldn't have gotten along well with the lacrosse players that were sleeping on my floor the same weekend. Fishermonkey pops and sourbobbles, and balloons behind the chairs. (What demented architect of this building decided we needed to have a support pillar in the corner of the room?) In the world of "Marooned in Realtime," set 50 million years in the future, the "fishermonkey" fills the same ecological niche as the present-day otter. Therefore it logically follows that a fishermonkey pop will fill the same place in the food chain as an otter pop. The little red cooler has 100 otter pops in it, and about 5 lbs. of dry ice purchased from the Baskin-Robbins in Solano Beach. 5 lbs. may be more than we needed - we could have got by with less (say, 3 lbs.) if we'd purchased it earlier and given it more time to freeze. There was still dry ice chunks at 2 am that night, so we could have obtained the dry ice first thing that day. The table is borrowed from my sleeping room, as is one of the chairs. (I wanted to have more furniture in the room.) The little plastic things on the table are "Soap Bobbles." We bought the party-favor size, they're marketed as Bridal Bubbles. On the right is a cooler labeled "GOH-flavor Soda" - it contains regular and diet Vernors ginger ale. Each balloon under the table and throughout the room has a little green army man in it. This is a reference to the bobbling of soldiers and weapons (and some innocent bystanders) when the Peace Authority took over the world. Vernor Vinge inspects his halo. (Since Vernor created the universe that inspired the party's theme, he is therefore the god of the party.) Ben Massoglia and Charles Herbig on the right. 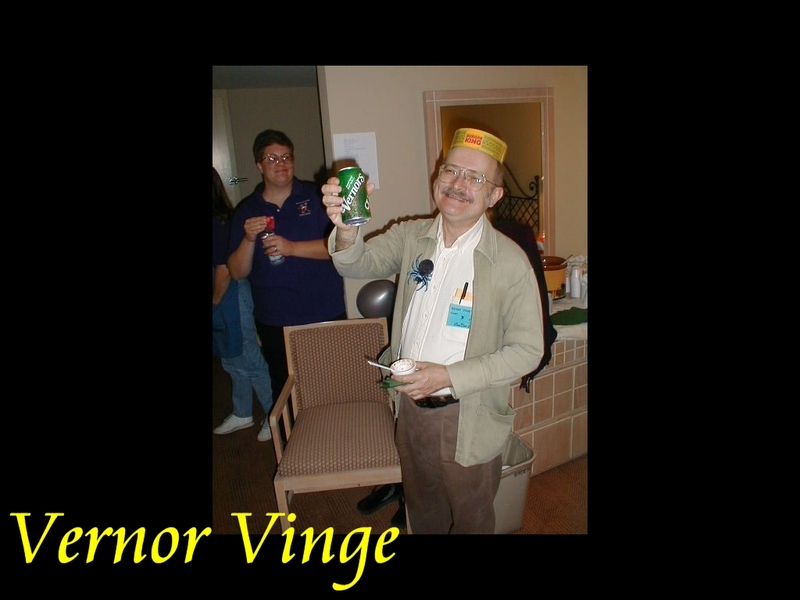 Lynn Baden watches in the background as Vernor Vinge enjoys a Vernors soda.